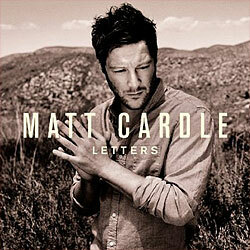 The winner of the 2010 X Factor final, Matt Cardle, has released his first album. In a nutshell, if you liked his winning song and first single release, When We Collide, then you will like Letters. The single sets the tone for the whole album. On the other hand, if you do not like massive productions that swamp the singer and end up sounding all the same, then you will not be impressed by Letters. This approach to record production seems to apply to all the X Factor contestants who secure a deal with Simon Cowell, and it will henceforth be known as the "X Factor sound". Matt Cardle was a worthy winner of X Factor and it looked as though he was a little more independently minded than previous winners. Hence the expectation that his first album would have a more individual sound. He is an accomplished guitarist and the natural thing would have been for his own playing to feature on the album. What we have ended up with is Matt Cardle co-writing the songs and then the resultant recordings sounding like typical X Factor music i.e. mainly slow to medium tempo songs which start quietly and quickly build up to a loud and undistinguished musical backing track which swamps the singer in epic proportions. This is now a well worn formula and strangles individuality even if it proves commercially lucrative in the short term. There are 13 tracks on the album. Three single releases are to be found - When We Collide, Run For Your Life and Starlight. All these tracks illustrate the X Factor sound and if you like it then the album is a must buy item for you. However you have to feel sorry for Matt who is straining his falsetto voice to be heard in the loudness of it all. A number of the songs would have been better treated with a quiet acoustic backing to Matt's voice. Faithless, Reflections, Walking On Water and Slowly would all have been much improved with a lot more restraint shown. Presumably the end result was the wish of the producers and not Matt Cardle himself. There is a 2 CD version of this album available, the second CD featuring 5 acoustic songs - For You, Letters, Amazing, Slowly and Walking On Water. This is not yet to hand and when it is it will be interesting to compare these versions to the full blown album tracks. Well, there we have it. A must for Matt Cardle and X Factor fans but not much here to interest the rest of us.